Under “World Architecture Day” annually celebrated in all over the world on the first Monday of October, the Building Information Centre (YEM) organized Architecture Week between October 3 and 7, 2016. 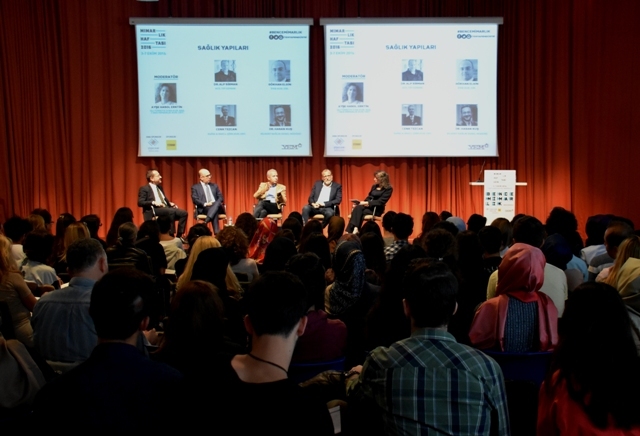 More than 50 speakers and more than 200 participants attended the event where 10 sessions were organized in 5 days with following titles: Courthouses, Handicapped Designs, Education Buildings, Museums, Hospital Buildings, Hotels, Cultural Buildings, Media Centers, and Movies and Architecture. Participating in the session concerning the Medical Structures, IPCU Director Kazım Gökhan Elgin was accompanied by other speakers including Emergency Medicine Specialist Physician Alp Sirman, Bilkent Health General Manager Physician Hasan Kuş, and BWISE & BWELL Companies’ Founding Partner Physician Cenk Tezcan. IPCU Director Mr. Elgin said that the Göztepe Training and Research Hospital, the design of which was selected pursuant to a contest, previously had 8-bed ward system while the hospital handled under ISMEP project with a new design would have patient rooms with one bed or two beds featuring high quality bed technologies, with the design enabling to increase the patient capacity in case of emergency by converting the one-bed rooms into two-bed rooms. Mr. Elgin indicated that, along with Göztepe Training and Research Hospital, reconstruction works of Kartal Dr. Lütfi Kırdar Training and Research Hospital and Okmeydanı Training and Research Hospital against earthquake risk were in progress, and those hospitals were designed in accordance with internationally accepted LEED Gold Certificate showing compliance with green building criteria. Mr. Elgin stated that, during the design process of the hospital which lasted 2.5 years, they adopted a participative approach by holding nearly 40 meetings with the Ministry of Health, the director, the chief physician, chiefs of clinics, and nurses of the hospital. Mr. Elgin went on to further state that they constructed hospitals of the future with projects prepared according to sustainability, efficiency, green building concepts backed by appropriate materials, and the hospitals would be able to provide uninterrupted service during earthquake by means of seismic isolators used in such hospitals.